The torrents of water that raged down onto this city, killing hundreds of people, are testimony to a man-made ecological disaster. Poverty has transformed Haiti's once-verdant hills into a moonscape of bedrock ravaged by ravines. More than 98 percent of its forests are gone, leaving no topsoil to hold rains. Even the mango and avocado trees have started to vanish, destroying a vital food source in favor of another necessity for the impoverished — charcoal for cooking. "The situation will continue, and other catastrophes are foreseeable," Jean-Andre Victor, one of Haiti's top ecologists, said in the capital, Port-au-Prince. More than 800 are dead across Haiti from floods spawned by Tropical Storm Jeanne over the weekend, with 1,000 more missing and presumed dead. In May, light rains triggered floods that killed more than 3,000 people on Haiti's barren southern border with the Dominican Republic. "When you remove vegetation, the topsoil washes away. The earth isn't capable of absorbing rainfall," said Rick Perera of the international humanitarian group CARE, which supports alternative energy programs in Haiti to lessen dependence on charcoal. Less tree cover also means less regular rain, since trees "breathe" water vapor into the air. The result is a dropping water table, making for even poorer farmers, the backbone of Haiti's economy. A 90-minute flight from Miami, Haiti is one of the poorest countries in the world. Most of its 8 million people don't have jobs, and political instability discourages foreign investors. U.N. Secretary-General Kofi Annan urged donors on Wednesday to help Haiti recover from the "devastating natural disaster." But it's very much a man-made one. Most Haitians are descendants of African slaves brought over in the late 1600s by French colonizers who destroyed tens of thousands of acres of virgin forest to plant the cane that made Haiti the world's largest sugar producer. More wood was cut to fuel the sugar mills. Entire forests were shipped to Europe to make furniture of mahogany and dyes from campeachy. After rebellious slaves defeated Napoleon's army and Haiti became the world's first black republic in 1804, great plantations were divided among the slaves. Under an inherited French law, land is shared among a man's heirs. One of the fastest growing populations in the world — Haitian women average five births each — has reduced the average holding to little more than a half acre. That's not enough to support a family of seven even in a good rainy season. Pressed for income, farmers chopped trees to make and sell charcoal. From the air, you can see the border with the Dominican Republic, which shares Hispaniola island with Haiti. Lush forests stop suddenly and give way to barrenness. Vast stretches of the Dominican Republic remain in the hands of a wealthy few. The difference in vegetation also is reflected in the death tolls. The Dominican Republic lost just 19 people to Jeanne, including 12 people who drowned in swollen rivers. 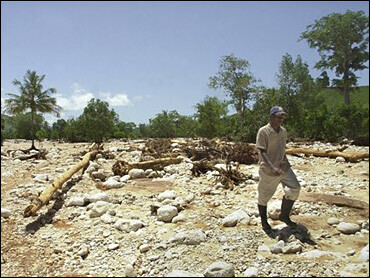 In 1950, about 25 percent of Haiti's 10,700 square miles was covered with forest, said Victor, the agronomist. In 1987, it was 10 percent. By 1994, 4 percent. Now, foreign and Haitian scientists find only about 1.4 percent of the Maryland-sized nation is forested, he said. Here in Gonaives, where rebels launched the rebellion that forced out President Jean-Bertrand Aristide last February, Jeanne deluged the region with rains for some 30 hours. Water-logged valleys behind the mountains funneled torrents of water that bloated the four rivers surrounding the gritty city of 250,000 people. After the May floods, interim Prime Minister Gerard Latortue, said, "The root of the problem is that we have to go and reforest the hills and until we do that, every two, three, four years after some heavy rain, the same thing could happen again." Over the past 20 years, the U.S. Agency for International Development has planted 60 million trees in Haiti, but the poor chop down 10 million to 20 million trees each year, said David Adams, USAID director in Haiti. Perera, the CARE official, said small-scale replanting projects and pilot programs using alternative cooking fuels such as solar energy and propane are trying to change habits. Still, 71 percent of the energy used in Haiti comes from charcoal, Victor said. Though the deforestation is obvious, many steeped in superstition believe the disasters are caused by a higher power, a belief that officials say makes it hard to fix the problems. "It was God who made this flood," said Eliphet Joseph, a 43-year-old salesman. Other people blame decades of official corruption and mismanagement. "The whole country's environment is messed up, that's why we had these (floods)," said Cherly Etienne, 28, who lost her cousin and aunt.